Increasing numbers of individuals struggle with obesity and yo-yo dieting, a term descriptive of an old paradigm of weight management — one that was destined to fail for the majority of people. It is an apt metaphor, however, because a yo-yo goes either up or down, just like a diet. You are either tightly wound up in rules and restriction, or unraveling toward the bottom again. When you struggle with overeating in response to triggers like boredom or stress, you crave junk foods. In other words, what you want to eat is affected by why you want to eat. Eating provides temporary distraction or pleasure but leads to more overeating because the boredom or stress always returns. When you go on a diet to regain control and stop overeating, the boredom and stress do not go away; so instead of junk food, you eat the foods allowed on the diet. You “binge” on vegetable soup or light popcorn. Eventually, you feel deprived, hungry or worn out by all the time and energy it takes to adhere to the rules. You then cheat, feel guilty, give up and go back to eating your favorite foods, in response to the triggers that you had not dealt with in the first place. You blame yourself for lack of willpower around certain foods, but it is not really about the food at all. This is the eat-repent-repeat cycle. In this addictive pattern, you move from one extreme to the other, feeling powerless to change without understanding why. You are either up or down over the course of weeks or months — sometimes in the same day or even in the same meal. You may eventually decide that you don’t want to spend the rest of your life in one of these two extremes, because there is no in-between with a yo-yo — you can only be up or down. So rather than a yo-yo, consider a pendulum. You have the freedom and flexibility to eat the foods you love, without feeling guilty. You fearlessly choose a variety of foods that nourish and nurture you. You love what you eat, savoring every morsel mindfully. You are able to sustain an intuitive balance between your eating and your physical activity, which allows you to reach and maintain a healthier weight without obsession and deprivation. You were born with the natural ability to effortlessly manage your weight this way. When you stop expending so much of your energy on overeating and restrictive dieting, you will naturally settle into a comfortable, centered space, freeing up your energy for more enjoyable, productive and fulfilling activities. The goal is not to stop dead in the middle, but to make mindful choices as each situation arises. Wherever there are extremes in your life, there are opportunities for you to seek balance and moderation. Could you benefit from more work-life balance? 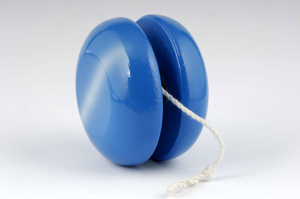 Do you yo-yo exercise? Could you allow yourself to be a less-than-perfect parent so that you can focus on your relationship, instead of trying to raise a perfect child? Where else in your life could you let go of the need to do it perfectly or not at all? A pendulum’s gentle arc requires much less energy to maintain, freeing you up to live a more fulfilling and vibrant life. Michelle May, M.D., is the founder of the Am I Hungry? Mindful Eating and Weight Management Program. She is the author of Eat What You Love, Love What You Eat: How to Break Your Eat-Repent-Repeat Cycle. www.AmIHungry.com, MMay@AmIHungry.com or 480-704-7811.